But, believe it or not, this novel is also a love story; unfortunately, not one with a happy ending. The husband finds a love letter from his wife to another man. He contemplates killing the other man, but he can’t take the man from his children who remind him so much of his own. So the heartbroken husband decides to leave his family and Cuba, and travel to America on a raft. He and seven others start out, with the husband promising to entertain them with stories that will take their minds off the dangers of their voyage. And so begins our tale. Aleman cleverly weaves a story within a story. Readers will not get lost as the author makes reality and illusion very clear. One on hand we have balseros fighting for their life on their way to freedom; on the other hand, we have a captivating tale of love, violence, depression, hope and redemption. There is Octavio and Adriana who can’t make their marriage work despite their love. He goes off to war again and she enters into an abusive second marriage. When her husband puts her in the hospital, her teenage children go to live with their Uncle Diego, an artist. He shelters the kids and teaches them to trust again. Diego is an optimist but he too despairs, especially when his church is less than welcoming of others and when the woman he loves –Ling – is too scared to accept his devotion. But he refuses to give up – on God, on Ling, on himself, on his fellow man. Diego’s steadfast strength gives the others hope. To read The Latina Book Club’s 2011 interview with Carlos Aleman, click here. 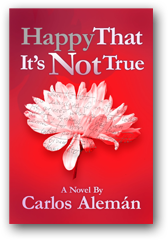 ABOUT THE AUTHOR: Carlos Aleman is a Cuban American, born in New York City. He is a writer and an artist. He lives in South Florida with his wife, Jean. Visit him at www.carlosaleman.com.